we had to go back and retrace our steps in the dark which I suppose is the meaning of life. 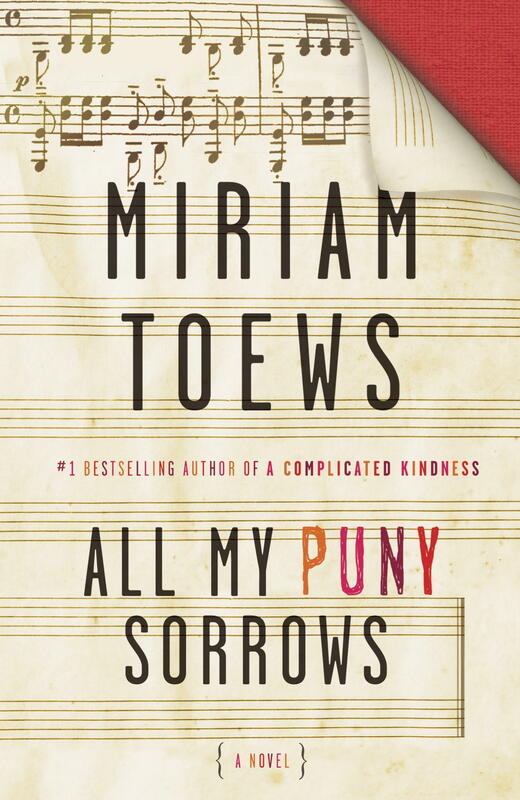 Miriam Toews’s conspicuously autobiographical novel All My Puny Sorrows is the story of two sisters, Elfrieda and Yolandi — from a Mennonite community, like Toews, and with a father who, like Toews’s, committed suicide. Elfrieda, like Toews’s sister, is a pianist; the novel is narrated by Yolandi, who (like Toews) has dealt for much of her life with her sister’s depression and suicide attempts. Because Yoli’s perspective necessarily dominates, we never understand Elf’s feelings as clearly as we do Yoli’s rage and grief and love and baffled desperation. But this seems right in any case, since Elf’s point of view and feelings are, almost by definition, not neatly explicable: if they were, she wouldn’t be so tormented, not to mention so frequently hospitalized, medicated, and restrained. Yoli is dedicated to saving Elfrieda from her “weariness of life.” But does saving Elf mean keeping her alive or letting her die — or even helping her find a way to die? Much of the novel turns on Yoli’s deliberations about whether and how she might do the latter: sneaking away to Mexico for a final toxic cocktail by the beach, or going boldly to Switzerland, where “mentally ill people … have the same rights as anybody else who wants to die.” “The core of the argument for [suicide],” Yoli explains to a friend, “is maximizing individual autonomy and minimizing human suffering,” but she herself remains irresolute about whether it’s better for Elf to live or die, or about whose choice that is to make, and ultimately she is saved from decisive action by the unwitting intervention of other characters. The ending hints that Yoli would have decided for Switzerland, but it’s suggestive, not definitive: it may be that she is just wishfully comparing the orderly Swiss process she imagines to the jarring reality. Toews does Yoli’s voice well: by the end I definitely felt as if I’d been up close and personal with her trauma. The novel is not all crisis all the time, though: something else Toews does well is mix in humor, sometimes to nicely ironic effect — which can certainly happen when we’re dealing with sad or scary things in real life too. The family members and friends are vivid and lifelike, with their eccentricities and tensions and intertwined histories, and there’s tenderness, too, along with the laughter, as they do their best, as we all must, to get from one day to the next. But the colloquial first-person narration was ultimately too chatty and artless for me: Yoli / Toews is neither a great writer nor a great thinker, so not only is the prose mostly quite pedestrian but the novel does not expand beyond Yoli and Elf to explore the abstract problem their conflict dramatizes. To me, the novel ended up feeling small, even confined, as a result, even though it deals with some of the biggest questions there are. I would have liked to learn something, to have been offered some illumination, something to take away from the novel beyond description at the level of “this is what it felt like for me” — and while “for me” officially means “me, Yoli,” it’s hard not to think it also means “me, Miriam.” There’s a pleasing humility in sticking so close to home, and so close to one’s own heart, but there’s also something unambitious, even unimaginative, about it. Toews does a good job at “write what you know,” but All My Puny Sorrows also shows the limitations of that precept: as a reader, you get to know her, but not a lot else. But why isn’t that enough? I realize that I am criticizing Toews not for failing at what she set out to do (because she doesn’t) but for not setting out to do something different — something less personal but broader and more ambitiously philosophical, something less intimate and colloquial and more stylish. (One of my marginal notes asks whether coming up with good one-liners really counts as having a style. She does get in some good ones: as a long-time user of the product, I chuckled especially at her observation that Vaseline Intensive Care lotion has been renamed “Vaseline Intensive Rescue lotion,” “to reflect the emergency atmosphere of current life on earth.”) I’ve been struggling for a couple of days to explain (or maybe justify) my lack of enthusiasm, especially when there are other small-scale novels I like very much — most of Anne Tyler’s, for example. It’s possible that my dissatisfaction with All My Puny Sorrows is a side-effect of reading it right after King Hereafter, which is not just large in its scope but deep in its inquiries, not to mention challenging, and thus exhilarating, to read. (For a book about suicide, All My Puny Sorrows really skips right along.) But I think that another reason for my impatience is, a bit paradoxically, that the situation of the novel is in some ways quite familiar to me. For years a very close friend of mine struggled with serious and suicidal depression, so Toews’s novel brought back a lot of memories, of anxious waiting, of difficult, sometimes frantic, phone calls, and of many, many hospital visits — during all of which I had no power or responsibility except just to be there as much as I could and keep on being her friend. Because I was not family, I had less say and, in a way, less at stake than Yoli does in Elf’s care and future. It was an intense and pretty challenging experience nonetheless, and the novel’s focus on the supporter’s perspective rather than the patient’s had a particular resonance for me. Shouldn’t that personal connection have made All My Puny Sorrows more, not less, meaningful to me, though? Why, with that experience of my own to think back on, did I find myself resisting Toews’s novel rather than appreciating it all the more? My theory is that it’s because her story is precisely not mine, and so the similarities between them only become really interesting if we go to a higher level of abstraction. She can tell her story, and I can tell mine (though I decided not to do so in more detail here, since in so many ways it is someone else’s story more than mine — which for me raises further questions about Toews’s strategy of making art out of her sister’s death). Unless there’s more to it than that, though, the result is just an accumulation of anecdotes. I don’t deliberately seek out literature that I expect to reflect my own life back at me, but because in this case I did find myself prompted to retrace my steps through some very dark territory indeed, I would have liked to do so in the company of someone who had more to say about the meaning of it all than I can manage on my own. I have an uneasy feeling that I’m selling All My Puny Sorrows short. Lots of people have really, really liked it — including readers whose judgment I greatly respect. I’m not even sure that I’ve figured out my own reaction: all I know is that I wanted something from it that I didn’t get. I look forward to discussing it with my book club tomorrow night. At this point my favorite thing about the novel is that it included Philip Larkin’s “Days,” which inspired me to spend a sunny hour on the deck yesterday reading through his collected poems. That’s an interesting observation about Toews’s ambition, and thinking back, I can see that AMPS does reach outside the personal — the abundant literary quotations and allusions could be seen as a symptom of that. I wonder what would happen if she let go of first-person narration. This is a thoughtful review, and I share many of your opinions. As I stumbled through the book, I found it particularly hard because, as you said, the delineation between Yoli and Toews is a blurry one, so I struggled with how to address my criticism. Well done. Thank you! I took another look at some of the mainstream reviews of the novel after I posted this and they are really overwhelmingly positive, as are most of the comments on GoodReads. My own response is just a lot more mixed or ambivalent. A lot of fiction has autobiographical elements: I wonder why we feel that it’s a problem in this case. Yes, it’s really hard when one feels like a loner with a dissenting opinion! I wrote about the book as well — and struggled. For me, the “snark” and kitsch grew on my nerves and interfered with what she has tried to convey. You’re correct that autobiography can creep into fiction very easily. I think in the author’s case (I also read A Complicated Kindness, which is set in a rural Mennonite community), she is very upfront about that. And because AMPS, in particular, deals with an uncomfortable and unfortunate issue, I was left not being entirely sure how to handle it. But, yes, because of the overwhelmingly positive reviews, I feel like I must be missing something. I like this line from your post: “Both works are obviously ripe for a lot of introspection, which Toews accomplishes in her own way. And I guess it’s just ‘her own way’ that doesn’t suit me.” I’m reminded of the discussion on my post about Let the Great World Spin: we like and dislike books for reasons that aren’t always reasonable or transparent. But you and I both tried to make sense of our reactions, which seems to me the fair thing to do: if something doesn’t work for us, that doesn’t mean it’s no good in some absolute sense. Also, I think the vast majority of books are somewhere in between “brilliant” and “lousy,” so mixed reactions make more sense than either effusive praise or vicious pans. Like you, I see my blog posts as “ruminations,” not definitive statements, too. If I were tasked with writing a formal review of AMPS, I would try harder to sort this all out! I can hardly believe that a professor of literature would censure authors for telling stories that rely on their own agonies and experiences for raw material! You’ll have to set aside most of the Western canon. Too bad you weren’t around to save James Joyce and D.H. Lawrence from embarrassing themselves. And I have to say this is the first time I’ve heard it said that authors should make their stories less specific and more abstract. I hope this is not a new trend among creative writing teachers. I count myself among the many enthusiasts of this novel. I’ve enjoyed discovering that my love for Yoli and Elf is shared by so many others, which is how I came across your review, and these ones. For me there is no question that Toews is a master stylist. Her great strength is voice. The prose is anything but “artless” or “pedestrian” (reading that made me laugh out loud!) — no adjectives could be any less appropriate to describe Toews’ writing. Yolandi’s ungainliness, if you want to see it that way, is partly manufactured; it keeps the reader from the abyss of Elfreida’s despair, and it avoids the possibility of Toews’ own grief from creeping into the narrative and breaking the dream. Few writers in the world use language as originally and skillfully as Toews, and for me it explains how she manages to inject so much emotion straight into the veins. Without the “chattiness” as you call it, without the easy wit and lightness of form, the reader would not be able to engage in the darkness and would not be blindsided by so many deep feelings and big questions. Humour in literature is not appreciated by many readers, you are not alone in that, and there’s certainly no obligation to be touched by this book, but by reproaching AMPS for not providing instruction or illumination or the meaning of life (which it does in fact), I wonder (as you do) if you are simply confronting your own shortcomings. I think few books are so full of love and acceptance of humanity, and there is guidance to be found there. Yolandi is not “saved from decisive action by other characters.” Yolandi simply does not decide, that’s the whole point. Could a novel express more comprehensively how such a decision verges on the impossible? The “suggestive” ending is pitch perfect, and I simply could not think of a better, more heartwrenching and poignant final scene. It really is remarkable how well structured the novel is, gathering in speed and then slowing down, always in harmony with the events being recounted. Also, it almost goes without saying, one’s resistance to a book is a personal matter and of no real interest as critique. Here’s what has truly prompted me to respond to your comments: the nasty implication that Toews’ novel is morally questionable because, as you put it, she has made art out of her sister’s death. I can only imagine how offensive that would be to Toews. The novel tells Yoli’s story, not Elf’s, but at the same time it truly does honour the exceptionally complex Elfreida — and by extension, we may speculate, her sister. Elfreida’s soul is impenetrable and for that reason she is a constanct provocation to Yoli and the world. She wants to die: no pat answers are available. The dead deserve to have their stories told as well, do they not? This is how we pay tribute to the weak and the marginalized, and it’s how we pay tribute to the deceased as well. Toews has told an imagined version of her sister’s struggle, and her own, and she has done it admirably, beautifully, intelligently and honestly. Alex, you’re absolutely right, of course, that much great writing draws on the authors’ personal experiences, and I didn’t mean to “censure” Toews. I know that some writers have felt that doing so put them in a moral quandary, though, and not all friends and families have appreciated it either, so as with so many literary questions, this one gets pretty complicated pretty fast, doesn’t it? I did my best in the post to explore why, despite the things I did appreciate about the book (which, as I say in the post, included its humor) I still found myself fairly disengaged from it or uninterested in it. It was not meant to be a prescriptive declaration about what all books should do, and you may be relieved to know that I do not teach creative writing, never have, never will — I react to books as a reader and a scholar and a critic, and of course, as you say, as a person, with all the limitations that entails. There’s no question that many readers reacted to AMPS the way you did — and I read some of the same reviews you link to and more, which is one reason I spent so long trying to figure out why I didn’t. The issue of why we like or dislike books is always a puzzling one (and it’s one I’ve had a go at investigating in other posts too). Interestingly, in this context, opinion was also very divided at my book club discussion last night. Some people actively disliked Toews’s writing style; several found the characters unrealistic or reduced at points to caricatures while others really loved at least some of them; some found the novel as a whole very emotionally moving while others shrugged their shoulders at it; some agreed with me that the chatty voice was, at least sometimes, off-putting, while others had enjoyed it; some found the narrative fragmentation distracting and ineffective while others thought it was a good way of approaching the problem you identify of approaching the very difficult questions the novel grapples with. Other commenters here have also had fairly different responses to the novel. That’s what makes books — and discussions of them — so interesting. No two people ever read exactly the same one. Sorry for the slight delay in the appearance of your comment, by the way, and thus of my reply: the links in it caused it to be initially flagged as spam, but I found it and rescued it. Thanks for stopping by to share your perspective. It’s always intriguing to read a different take on a book! I did think this one was very good, because it takes the reader right up close to an almost intolerable experience, but holds us there gently, with wit, with kindness, so we can bear it and feel it at the same time. I think that’s hard to pull off. I’m basically a coward when it comes to reading, and don’t really want to sob my way through a book or wallow in catastrophic experiences. I wasn’t at all sure that I’d be able to get to the end when I understood what the novel was about. In a different pair of hands I wouldn’t have made it. I also wonder what one *could* say about the experience of finally losing a dearly loved suicidal relative that made sense of it or transcended it. There would be such a risk of falling into the Hallmark card type of bromide. You might be interested in Al Alvarez’s book The Savage God, Rohan. It’s quite old now, but it still has its moments, and as non-fiction/literary criticism has a much readier route to that transcendental perspective! I agree it would not be an improvement to turn a really hard problem into bromides! And I’m not sure what I was looking for was a transcendental perspective unless that means doing more than reporting how something felt in the moment. But you could explore the problem more deeply, and perhaps even have your protagonist make a choice and follow through with its implications. That’s not the same as “making sense of it,” which I agree could easily go wrong. Marking this so I can read it later, after I’ve read the book. I’m very interested in a dissenting opinion. I’ve avoided the book so far because I’m afraid my expectations are set too high, thanks to the glowing reviews and insistent recommendation all over the place! I can’t help but feel that my thoughts and all of those above would float around meaninglessly for Yoli. So maybe for Elf too. And Miriam. Opinions would fizzle before they could actually register. We talk too much. We should be eating ashes instead of telling stories about stories; quietly listening out for the aftershocks. To me, AMPS is nothing but a beautiful and painful room to walk around in. And now I’ve shut the door and left it all where it should be. There is nothing to say. Other than, perhaps, thank you, Miriam. I’ve just finished reading AMPS and it has taken me a few days to digest it properly. I was possibly in a similar position as you; finding the book somehow unsatisfying but not quite sure I was able to say why that was, or indeed what worked for me either. Even now I’m not sure I totally have a handle on it, but the further out I am fromfinishing, the stronger I feel that it is a better book than my first instinct told me it was. It didn’t grab me in a very personal way, but perhaps I was a bit too close to the subject for that, but I really liked Toews’s way of writing about grief and depression. The understated, simple way of describing life and death created a texture far closer to real life than much art does when it deals with these big, potentially melodramatic topics.